Taking care of your infant will involve careful planning and smart decisions. One of these decisions is ensuring that your little one’s baby bottle sterilizers are sterile. Many harmful bacteria can grow rapidly in milk, making it very important to give it more than just a regular wash. Infants have a much weaker and less developed immune system, making even the tiniest amount of bacteria potentially dangerous. Don’t take any chances and get yourself a baby bottle sterilizer. When searching for a bottle sterilizer, there are several factors to consider. First and more important is that they have a high sterilizing rating, at least killing 99.9% of bacteria and germs. Microwave and electric steam sterilizers are the most convenient as they work very quickly, especially compared to cold water solution models. Other convenient features include a large bottle capacity, one-button easy operation, and an alarm that lets you know when the job is done. Automatic shut off ensures that the bottles will be safe to use immediately, and will save energy. Compact plastic designs are preferable as they are easier to transport around and find space for on your countertop. If you’re just looking for a warmer, there are several models available that will evenly and efficiently warm your young one’s bottle. Are you tired of getting uneven heating within your traditional microwave when warming up your child’s milk? 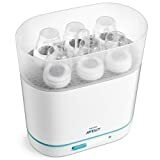 If so, you should check out this bottle warmer from Philips Avent. Coming in a reasonably priced package, this warmer can effectively heat up 4 oz. of milk in just 3 minutes. It comes with a convenient defrost setting that helps defrost breast milk or even baby food. It is built compact so it can fit on your countertop or nightstand. Best of all, there are no hot-spots, as the milk circulates during operation. 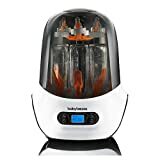 With an impressive capacity and inexpensive price, this sterilizer from Munchkin is an excellent choice for any parent with a baby. It can sterilize up to 9 bottles and/or accessories at a time. It is simple to use, with just a touch of a single button. It only takes 6 minutes to fully sterilize, and there is an auto shut-off when it is complete. The compact design and pleasant colors pull it together, making it suitable to place on your counter, or on your nightstand. This deluxe bottle sterilizer from Dr. Brown’s is a great choice if you’re looking for a high capacity, quality product. It only uses distilled water from within the unit, guaranteeing its safety during operation. The one button operation is simple to use and makes sterilizing multiple bottles at a time a breeze in just 12 short minutes. It can hold up to 6 standard sized bottles as well as an array of accessories. 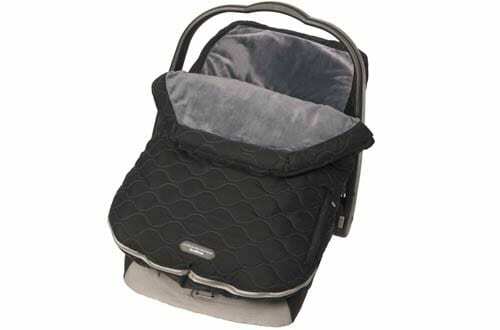 The removable basket holds everything in order and makes it very convenient to fetch after. This model from Philips Avent is excellent for sterilizing bottles in a fast and timely fashion. It is compatible with all Philips Avent brand bottles, and the plastic materials are fully BPA free. The compact and lightweight design makes it easier to move around. It works by filling with some water and then placing it in your microwave. With its compact and attractive design, this bottle warmer delivers consistent value. It works by creating a warm water bath to gently thaw and warm breast milk. The water bath ensures a more even heating, and unlike many other standard models, it doesn’t require constant refills. It features a long-lasting reservoir of water, and the auto shutoff feature ensures that it doesn’t get overheated. 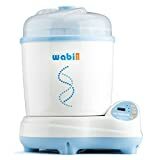 This top-rated electric steam sterilizer from Wave Baby is an excellent purchase that is filled with value. It comes with a smart sensor that will automatically shut off when it is done. This is different from other standard models that use a timer-based method. This gives it more versatility when sterilizing different shaped and sized bottles, which may take longer than usual. You can choose from drying settings from 30 to 60 minutes in 15 increments. It is easy to operate this device: just pour in the water, load it up and press the button. It can fit up to 8 standard sized bottles, and the panel includes a countdown timer. This high-end sterilizer from Baby Brezza is a solid purchase. It uses a natural steam cycle that takes 8 minutes. It is guaranteed to kill 99.9% of germs and bacteria. The dry cycle feature allows you to automatically dry bottle with 30, 45, and 60-minute settings. The control panel is elegant and easy to use with its clear backlit display. You can select sterilize only, dry only, or both. It can hold up to 6 bottles and includes extra space for other accessories. If you’re just looking for a cheap and convenient bottle warmer, check out this model from The First Years. However, this model is more than just a simple warmer. It also comes with a removable cooler that can hold up to 2 bottles. The cooler can keep these bottles cool overnight. The auto shut-off feature ensures your safety, and the variable design allows it to work with wide, narrow and angled bottles. It comes with a carrying handle for your convenience, and the compact nature allows it to fit anywhere.